We’ve got the hot selling blue & gold argyle pattern in stock in womens skorts. Just a few left in all sizes so do not wait. 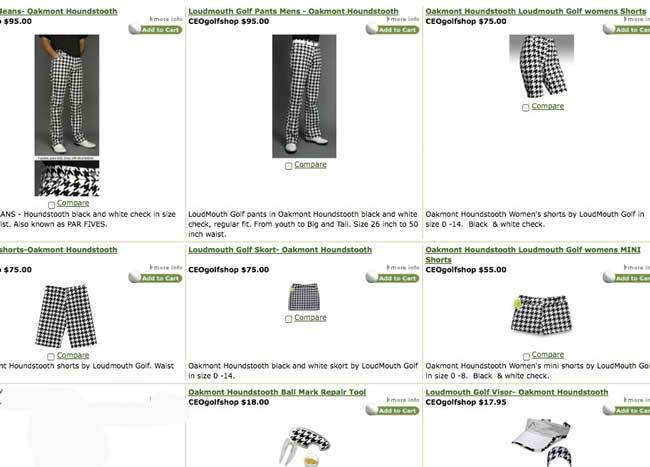 Black and white houndstooth apparel by Loudmouth Golf are in stock for men and ladies apparel styles. Comfortable and fun, without too much flash. We have both mens pants and shorts and womens shorts, mini shorts and skorts in stock. About Loudmouth Golf: Loudmouth Golf makes a wide variety of fun and unique clothing items and golf accessories. The wild and funky designs have been made ultra famous by PGA tour player John Daly and many celebrities. Customers buy this brand for the thrill of the designs. Fabric and manufacturing quality is OK. Special care is needed to keep the fabrics from fading or washing out. The manufacturer warranties all products against defect. CEOgolfshop specializes in volume orders for active lifestyle apparel and executive gifts. While most companies carrry only a few colors, we offer the entire line of each brand, so when a customer falls in love with a brand, they have the most choices. Many people ask if we have our own inventory, and yes, we do. We also ship direct from the factory for custom items to ensure product quality and provide full manufacturer warranty. We specialize in current season merchandise for the fashion forward customer. Loudmouth mojodelic, money pants and other new styles introduced by Loudmouth Golf CEO in PGA Tour Super Store interview. But wait, new Tommy Bahama style shirts are coming. Check this out! Loudmouth Golf makes a wide variety of fun, funky and unique clothing and golf accessories. Customers buy this brand for the thrill of the designs. Sizes are available for big and tall men. About CEOgolfshop.com: CEO golf shop specializes in volume orders of active lifestyle apparel and executive gifts. Embroidery and customization available for every suitable item. Shop online for Loudmouth Golf clothing now. 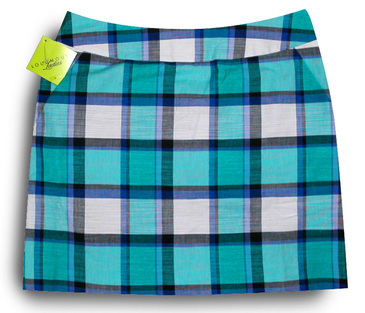 Bushwood skorts by Loudmouth Golf sizes 6, 8, and 12 are in stock for immediate shipment. This style is a consistent hot item. The pattern is popular for golf teams because sometimes it’s hard to find four people who all like to dress a bit wild and funky! We have this in both men’s and women’s so if you need to put together a team, order them now to ensure you have the right sizes for everyone. Though we stock the entire line, it’s hard to maintain every size in every color, and we’ll get more in again soon.